Christine Yoo Millar saw the Costume Rag’s image of a luxuriously-embroidered French court coat at the V&A in London and felt immediately inspired. 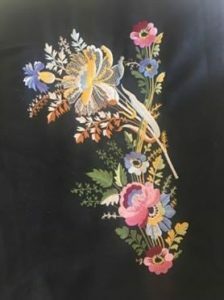 Having learned to digitise historical embroidery at Costume College – an annual three-day costuming arts conference in California – she undertook an incredible project that would see her recreate by machine what would have taken a skilled 18th Century craftsman months to achieve by hand. “I chose to digitise the V&A coat after running into it on the Costume Rag site. I had glimpsed at the coat before on Instagram but a close up of its trailing lines and masculine flowers sealed the deal for me. I also thought it would be a unique challenge to try a pattern so definitely difficult to digitise. 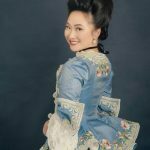 I enjoy making frock coats, in particular embroidered ones from the 18th century, and have so far made two – a black one that my husband wore to the ball at Versailles in 2017 and a pink one that I wore for Costume College. Both those patterns were digitised for me by the incredibly talented Cari from Cabbit Corner Embroidery. After that I did want to try a third coat but chose to digitise this one myself since I knew how busy Cari had been since July. I use PE Design 10, an incredible clunkering piece of software made by Brother that I got in a bundle with my embroidery machine (A VE 2200 by Brother). 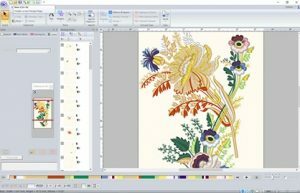 It allows incredible precision and control as long as you don’t mind it nearly crashing your operating system every 10 minutes and waiting 45 seconds between embroidery design decisions! It helps to watch Poirot while digitising for that reason. I was taught by Cari herself and some courses I took at Costume College this year, and by the master of all historical embroidery, Denise Hendrick of Romantic Recollections. It was a slow process as I am an utter amateur myself. In any case after about 14 hours of machine digitsing and 12 episodes of Poirot later I did manage to finally finish the initial design. At this point I realised the colours on the outside of the coat and that I had based my design on were faded. They were completely wrong – especially when compared to the waistcoat where the colors had faded significantly less. It was not just a matter of changing the thread colour as through the fading a lot of shading, detail and shape were lost in the pattern as well. I went back to my surface book and loaded up my PE Design 10. Six hours later the design finally looked about right. There is still probably about 300 hours of work between now and a completed outfit but it’s comforting to see the design embroidered and there are probably 3-4 drafts of embroidery before I’ll be completely happy with the design – and that’s before I even begin placement on the actual coat. But honestly, that’s the whole fun of it!